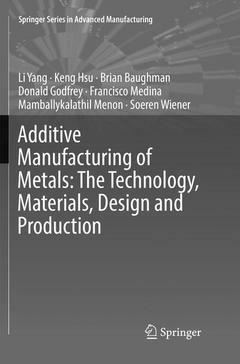 This book offers a unique guide to the three-dimensional (3D) printing of metals. It covers various aspects of additive, subtractive, and joining processes used to form three-dimensional parts with applications ranging from prototyping to production. Examining a variety of manufacturing technologies and their ability to produce both prototypes and functional production-quality parts, the individual chapters address metal components and discuss some of the important research challenges associated with the use of these technologies. Introduction to Additive Manufacturing.- Additive Manufacturing Process Chain.- Microstructure, Mechanical Properties and Design Considerations for Additive Manufacturing.- Electron Beam Melting.- Design for Additive Manufacturing-Draft.- Additive Manufacturing Quality Inspection.- Additive Manufacturing Supply Chain.